Since the success of the Kiddimoto superbike, they have introduced a variation of the wooden balance bike called The Scrambler Balance Bike. There are a number of differences with the style of this balance bike compared with the original superbike. The main one being the tyres, the scrambler has knobbly tyres to ensure grip, designed around off-road motocross bikes. Coming in 3 different colours, these include red, blue and orange, each of the bikes can be matched with accessories such as a variety of helmets and gloves. This stunning wooden balance bikes is made from birch plywood from sustainable forests and has pneumatic tyres and is suitable for ages 2-5 years. All Kiddimoto balance bikes can be made unique by adding a personalised touch. You can add your child's name on the side and the scrambler can also be personalised with a number of your choosing on the front. Helmets can also be personalised with a name too. 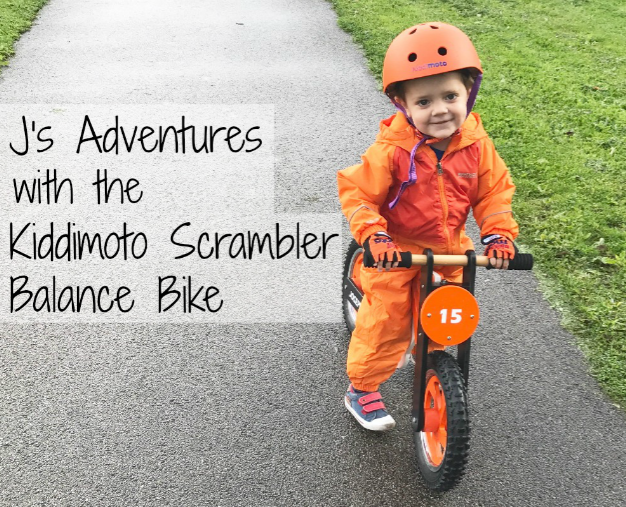 J was sent a Kiddimoto Scrambler balance bike as well as matching gloves and a helmet in the gorgeous orange colour design to try out and see how he got on with a balance bike to ride. After opening the package and building the bike, which was so easy to do, J was out in no time, donning his helmet and gloves and off he went on his new bike. The bike makes children ride in an upright riding position similar to regular bike so it gets them ready for being in the correct position when they're older. It also has an amazing grip on the tyres so is perfect for riding in the wet weather too. I was actually worried about J riding it at first but he took to it well, being able to balance it with his legs straight away and it didn't take long for him to be able to glide along the floor with his feet off the ground. I like that it teaches children the correct balancing method so that when it comes to riding a regular bike, they wont rely on stabilisers to keep them upright. The Scrambler is an amazing balance bike and will be thoroughly enjoyed for years to come! What a fantastic bike, I love the way you can put your child's name on too. Happy cycling! Looks awesone. I see so many out and about nowadays. Lucky Boy! That little bike looks super - what a lovely way to start! That looks brilliant, glad he had fun with it! That's a great idea for a youngsters bike, and that outfit certainly means he won't get lost easily! So cute. Love the colour, too. Easy to spot the children among others. That's such a cool bike and he looks like he is having a great time. A fantastic idea for kids! Love this - such a fantastic way to help youngsters with their balance and developing essential skills! I love how this looks like a real scrambler bike with knobbly tires and raised rear mudguard. These look great & sturdy.